If normal brewed coffee isn't always enough of a jolt to get you rolling in the morning, but you still don't like spending your mornings in long lines waiting for a latte, you should consider brewing your own espresso. 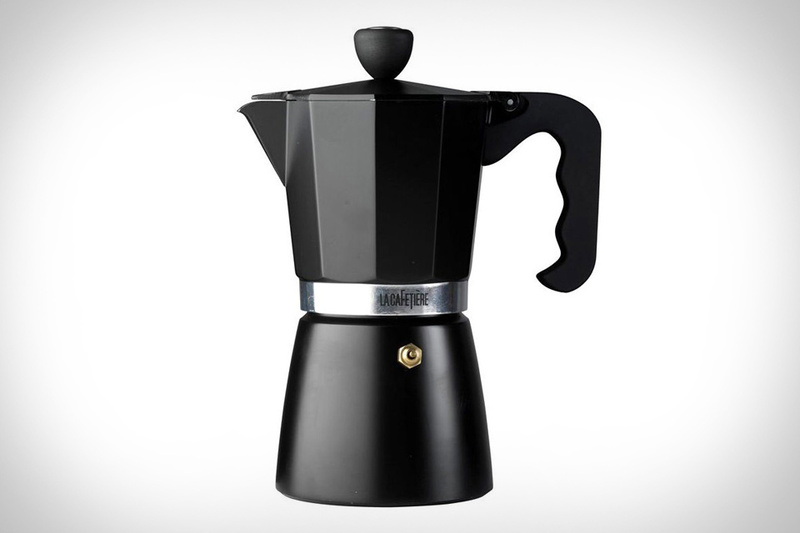 The La Cafetiere Stovetop Espresso Pot ($30) easily brews six shots of espresso at a time on gas, electric, and radiant cooking surfaces. The soft touch handle makes it easy to use, even when it's hot, while the durable aluminum body endures years of brewing. It's the perfect way to brew strong espresso at home or at work, and avoid all the frustrations of the coffee shop — now all you have to do is learn to make your own triple venti soy no-foam latte. Sure, there are worse things than those freezer-burnt excuses for waffles you get at your local grocery — but come on, you can do better. With the Waring Commercial Waffle Maker ($450), you can enjoy fresh, tasty, Belgian-style waffles at home — and it's pretty hard to beat fresh. This side-by-side waffle maker can cook two waffles at the same time, and its rotary feature lets you evenly bake and brown. Its triple non-stick coating virtually eliminates mess, while making it a breeze to remove your waffles, and the precise heating elements give you a golden-brown waffle every time. Add a touch of rustic charm (without sacrificing class) to your next meal with these Phillippe Starck Log Knives ($465). This set of six knives is made entirely from stainless steel, carefully formed, detailed with a wood bark design, and finished in matte. Each one is forged into a seamless piece of stainless steel, for workmanship that will last and last, while still maintaining a light weight that feels natural in your hand. If you've had the pleasure of enjoying a cup of coffee brewed in a Chemex (or similar pour-over coffeemaker), you know that there are few better ways to prepare your favorite morning pick-me-up — but you also know how difficult it can be to get it right. The Ratio Eight Coffee Machine ($400) combines the same principles used to brew by hand in a pour-over device, and adds precise technology so you get the perfect brew every time. Carefully heated water reaches the proper temperature for your brew, then pours water over the grounds allowing them to bloom, before finally pouring additional hot water to finish the brewing process. What you end up with is an excellent pot of fresh coffee, with repeatable results, and zero fuss. 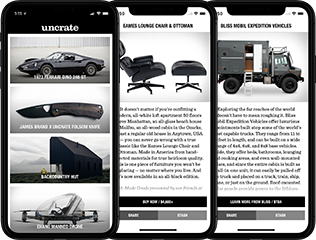 How could we not write about a drinking vessel that so obviously looks just like the Uncrate site? The Rogue Territory x Robert Siegel Tumbler ($32) features a tasteful, yet understated black and white color scheme, just like yours truly. Hand-crafted by artisans in downtown Los Angeles, each tumbler is completely one-of-a-kind, individually wrapped, hand stamped, and dipped in matte black glaze. They are three inches tall and three inches in diameter, making them perfect for sipping your favorite beverage. They are dishwasher and microwave safe, so you don't have to worry about messing up your new favorite cup — or its beautiful design. Sous-vide cooking — a method that uses carefully-regulated water at a low temperature to cook meat and vegetables sealed in an airtight bag — is a great way of evenly cooking food while keeping it juicy and tender. But previously the equipment needed for sous-vide cooking was prohibitively expensive, keeping it pretty much exclusively in professional kitchens. With the Sansaire Sous Vide Circulator ($200) you get all the advantages of sous-vide, without all the cost. This small, portable cooker lets you immerse it in any vessel, easily set the temperature, and leave it to work its magic. Just because there's a nip in the air, doesn't make a bowl of ice-cream any bit less delicious. So the next time you enjoy a few scoops, serve it in style with the Belle-V Ice Cream Scoop ($39). This ice-cream scoop is not only designed to be a beautiful object worthy of passing down through the generations — available in jet black, gun-metal gray, matte silver, or chrome — it's also built with ergonomics in mind, letting you comfortably use it each time. It features an angled head and a spade-shaped leading edge, so it's perfectly designed to scoop ice-cream with very little effort.